← Writing dialogue: Really?! I mean, really?! 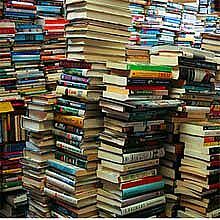 Books: What to keep, what to donate?! I’m renovating my house and the centerpiece of our new living room will be a huge bookcase that I found at an antique warehouse. It’s actually a reproduction of an English bookcase that originally came with a brass rail and a ladder. I’ve been coveting this for years. The plan is to take all my books that are scattered, piled, hidden and toppling all over the house, and put them on this monster bookcase. The “family room” is home to the television and the fireplace but our “living room” is where I will live. With the books. As we rearranged the bedrooms, the kids just went through all their books trying to decide what to keep, what to pass on to other family members and what to donate. Although my son tried to put the Magic Treehouse books in the “donate” pile I grabbed them out. I’m not willing to part with them. We read all of them (ALL of them!) to him when he was about four. Each night either my husband or I would read about a half a book to him before bed. We would have read the whole thing but it was too much fun answering the little guy’s questions and talking with him about the things he was learning. I can’t part with those books. Anything by Patricia Polacco: keep; Anything by Kevin Henkes: keep; All the Dr. Seuss: keep. Easy decisions. My daughter piled up a slew of books she read in middle school. You know the ones I mean: pictures of spoiled, nasty girls in cardigans on the cover and the stories all star spoiled, nasty girls and the stories are about spoiled, nasty girls. She loved those books. They got donated. She kept all her Scott Westerfield books; she kept all the Hunger Games books. And then there are the ones from my oldest daughter, who is going off to college in a minute. Her books get shifted to my bookshelf. My books get shifted to her bookshelf. I love that. We have so many copies, in hardcover and paperback, of all the Harry Potter books. They move from room to room in my house. The college-bound child gets to bring her own full set (our graduation gift to her) with her to school. I love that my kids have their own libraries, but I really love that I will soon have a home for all of my books and a quiet place to read and write. Perhaps I’ll give up one shelf to my husband for his books. Maybe. I don’t like to share. How do you decide what to keep, what to pass on? I know that a book is magic between covers and sharing is always a great option and a wonderful gift for the next owner. Keep some, share some, and GIVE some. What a mitzvah that would be. I ask the same question everytime.. Your new bookshelf sounds amazing!